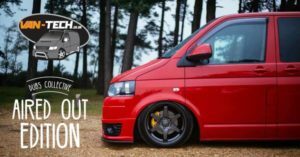 Dubs Collective ‘Party in the Park’ Sponsored By Van-Tech! Join us from the 21st to the 23rd of September for our Peaky Blinders themed VW Festival at Himley Hall. Those of you who had bought tickets for the April event, fear not, your tickets are transferable to the new dates. Whether you’re a happy camper or a day-ticket drifter, we’re sure you’ll love our range of attractions – from fairgrounds to a full concert stage, show n shine to a whole host of traders, show n shine and kids entertainment. Dubs Collective’s Party in the Park 2018 is sure to be a heck of a time! If you would like to pre-order any Van-Tech products for collection at the show call us on 0121 550 4628.